Hello, Come Home for Comfort readers! 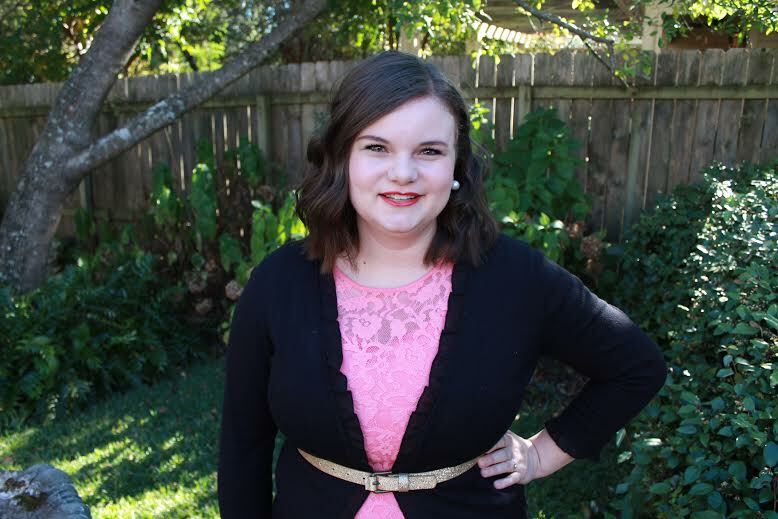 My name is Whitney and I blog at Polka-Dotty Place. I’m happy to be guest blogging for Whitney today. I am a wife and mama of two – Olive who is two and a little brother or sister on the way next Spring. I recently moved back to Indiana after living out west and down South for the last eleven years. I love to organize, make lists, watch football, travel with my family, plan parties and bake. 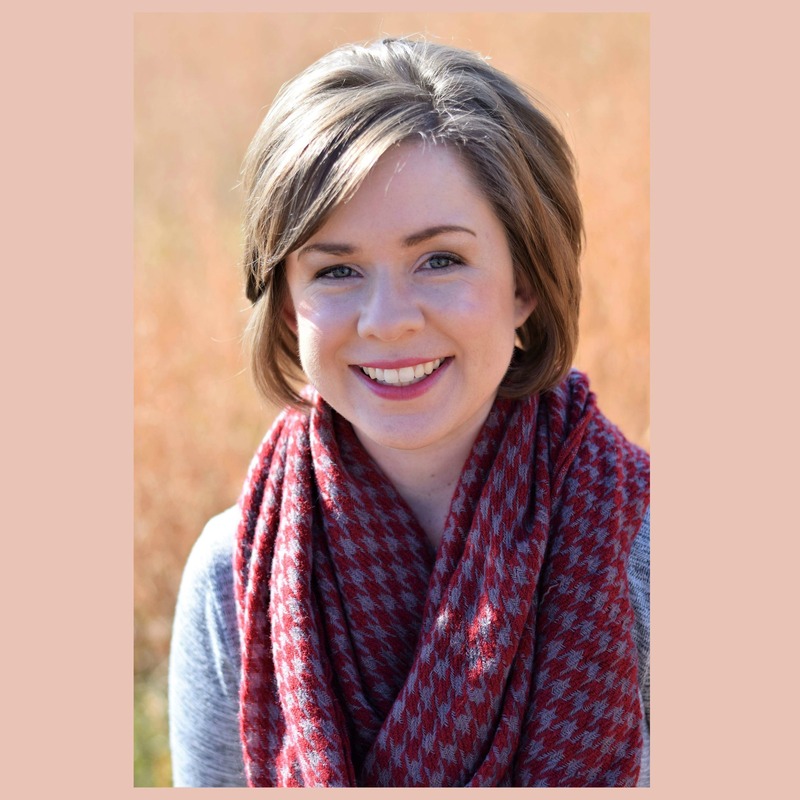 I blog about all of my favorite things – great recipes, holiday foods and crafts, my family, DIY projects, teaching toddlers, outfits, and events. I hope you enjoy the recipe I’m sharing with you today. I grew up cooking in the kitchen with my mom and have always loved fixing food for my family. When my daughter came along I was eager to get her in the kitchen with me. She’s two and she is a great little helper. My time in the kitchen with her isn’t as clean, efficient or neat as when I’m baking alone, but it’s so much more fun. We love making memories and messes together. Today I’m going to share with you a really easy recipe for Fall. 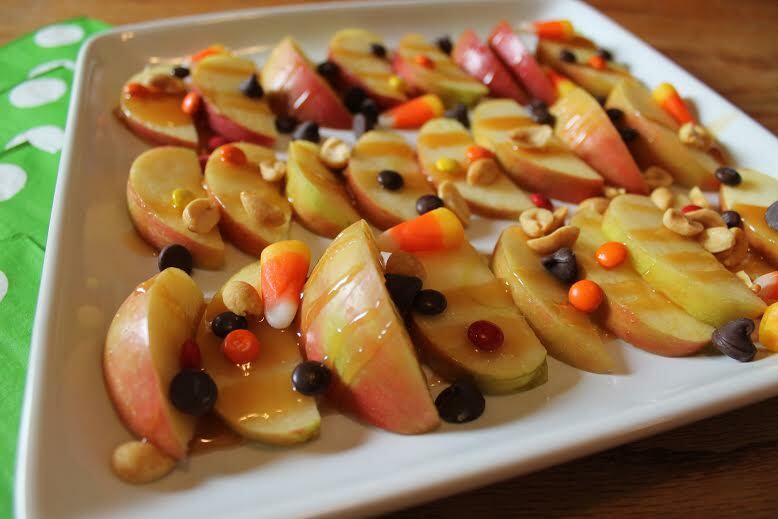 Apples are all so delicious right now so we decided to make a plate of Caramel Apple Nachos. Honey Crisp apples are our new favorite and I’ve found the best deal on them at Sams. We buy them in 2.5 lb bags for under $10. 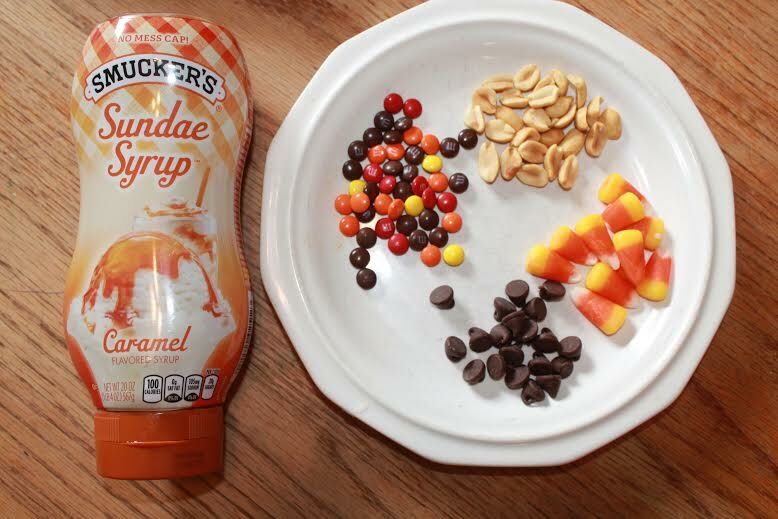 Candy toppings – I used a handful of chocolate chips, peanuts, mini m&ms and candy corn. I also think oreo crumbs, mini marshmallows, melted white or milk chocolate or almond slivers would be great toppings. I always plan ahead and think about the things I can have Olive help me with. I knew she’d do great with washing the apples, putting the cut apples on the plate and then adding the toppings. She knows she can help with some jobs and there are some things that I have to do by myself. We washed the apples, dried them and then I sliced them all thinly. She sampled a few to make sure they were okay to serve. We arranged them on the plate together and then I drizzled the caramel syrup on top. 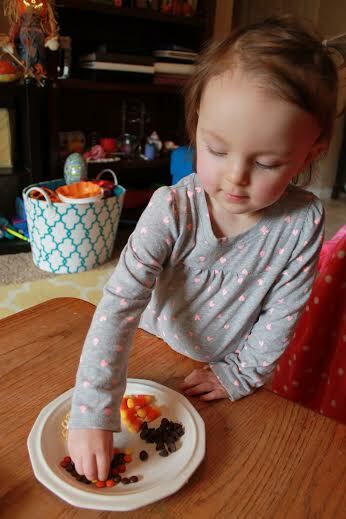 I put the toppings on a plate and then asked Olive to help me spread them out on our apple nachos. She loves the mini m&ms so she made sure to sample them, too. I plan for some sampling to happen when I bake with her and add just a few extra ingredients. We ate them nachos immediately after assembling them. They were delicious. I think these would be so much fun for a Fall party, a fun family dessert one night, a slumber party, a treat for friends or a treat for yourself. They were very easy to put together and could be made so many different ways. 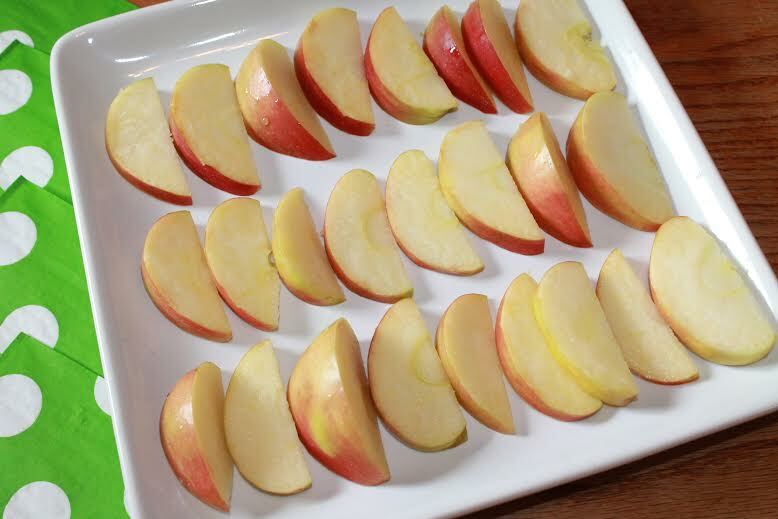 This recipe would be best served right away so your apples don’t turn brown and it does not keep very well so plan on making only what you need. Hope you enjoy some Caramel Apple Nachos at your house this Fall!! 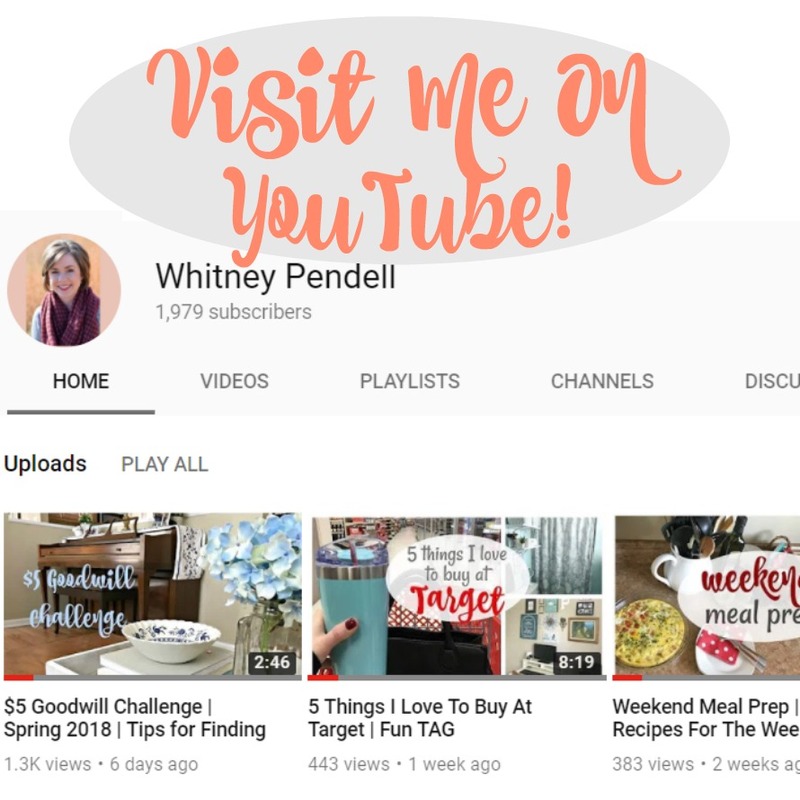 Previous Post High Five For Vlogtober! These look yummy! Great idea! Yum yum yum!! 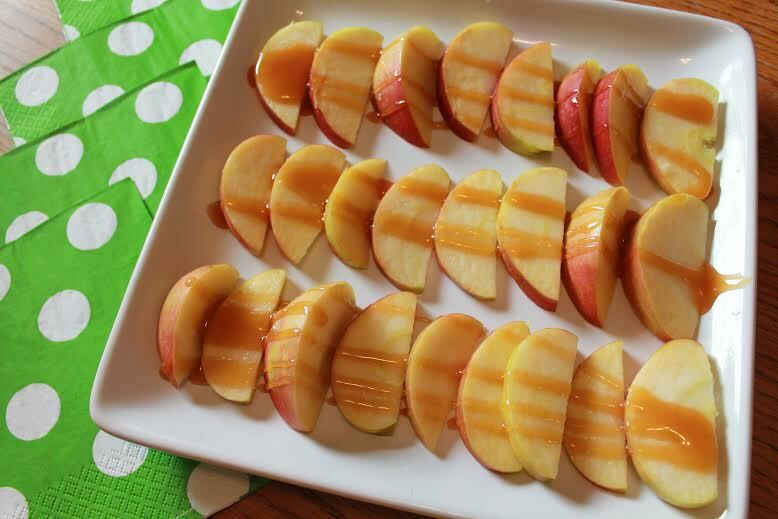 Can’t go wrong with honey crisp apples and caramel sauce 🙂 We need to try these. And Elizabeth is a big kitchen helper too. I forget to include her when I am quickly throwing together meals, because it’s faster if I do it. But I need to do better about including her, because she LOVES it! 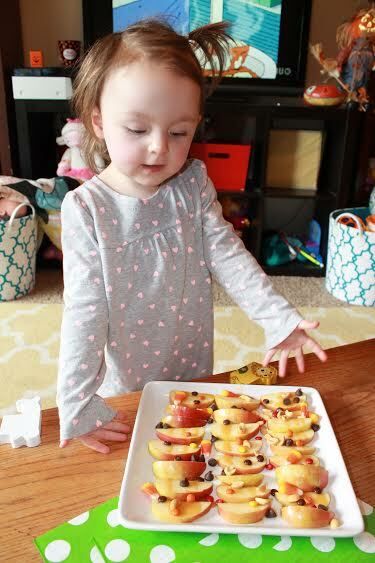 Cooking with toddlers definitely slows down the process, but the sweet memories are worth it. I don’t cook every meal with a tiny helper and love to include her on recipes she can really help out with 🙂 Elizabeth would be a darling tiny chef! Hi Whitney! These look so yummy! 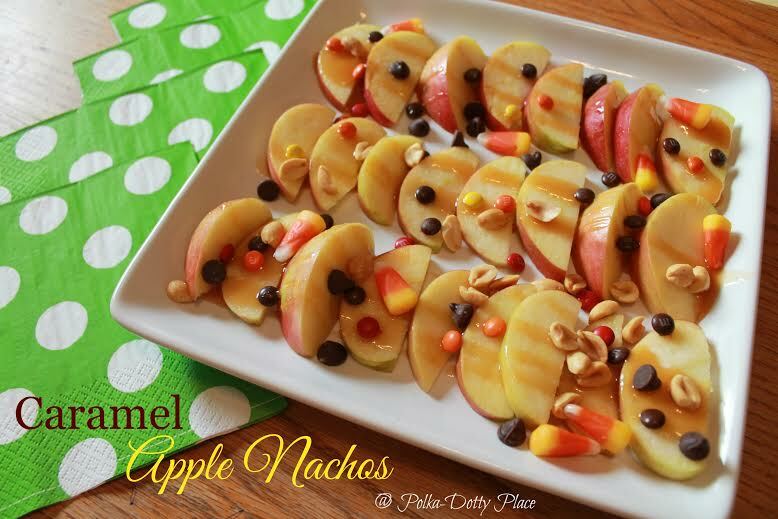 I love apples for fall and these nachos look like the perfect fall snack! Thanks for sharing! 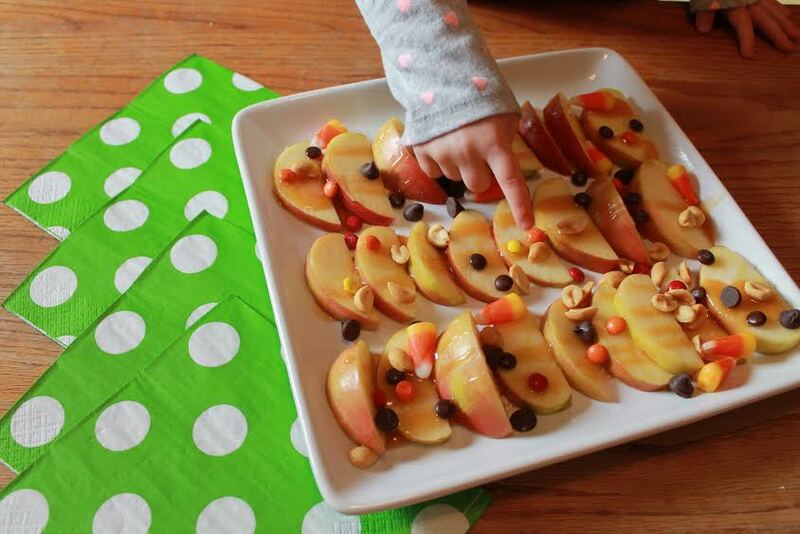 Thank you 🙂 We are eating a ton of apples this time of year so it’s fun to change up our usual treats with a fun new recipe.